Photo by Danielle and Tony Lombardo. A theatre performance is never the same twice. Numerous variables—the actor’s focus, the audience’s engagement, external factors like police sirens or some idiot’s cell phone—will change how the show unfolds. In improvisation, this is multiplied a hundredfold; the performers are writing the show in real time, and shaping the story, even if there is a structure they’re working within. 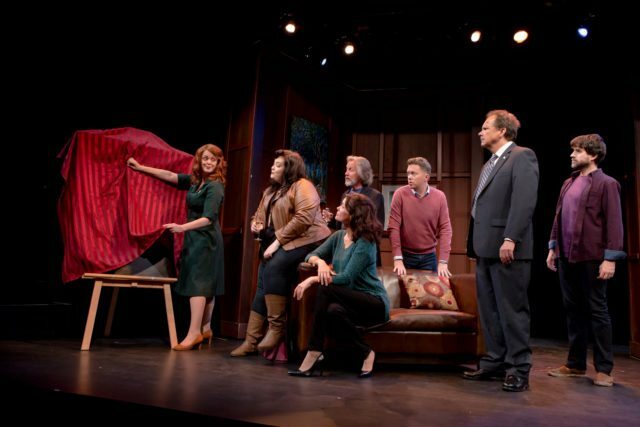 In Toronto, theatre audiences have been conditioned to think of improv as a comedy form, mostly by the enduring success of Second City. But it can be used for more dramatic purposes, as seen locally and recently in shows like the Wonderstruck series, or the improvised crime procedural True Blue. Perhaps the best example of this is Rebecca Northan’s Blind Date, in which she (as winsome clown Mimi) and a random audience member had a romantic adventure on stage, supported by several other improvisers (some of whom, like Julie Orton and Tess Degenstein, also became Mimis themselves). The show had a successful run off-Broadway and multiple remounts across the country. Now, Northan and her company Spontaneous Theatre have created a true ensemble show, Undercover, where an audience member becomes the lead investigator of a series of crimes, with Northan as a supervising detective. This format, with the audience volunteer interacting with multiple improviser-suspects at once, is considerably more complex than the simple and intimate mostly one-on-one of Blind Date. A lot more depends on the volunteers, who were mostly playing themselves in Blind Date, but here have free license to be good cop, or bad cop, or play outlandishly (though we suspect the improvisers are adept at pulling them back if things get out of hand). We’re loath to give much of the plot away; again, there is a structure, and an answer to the mystery, though how the volunteer detective arrives at it is up to them. But we will say this; the show works best when Northan is on stage as her cop character (most of the actors play multiple roles), acting as a foil for the volunteer. Sherlock had Watson, Riggs had Murtagh, Mulder had Scully— the exposition goes a lot smoother when it comes via a buddy-cop format. To October 29, Tarragon Theatre (30 Bridgman Avenue), Tuesday-Saturday, 8 p.m., Saturday-Sunday, 2 p.m. (no matinee on October 7), $22-$60. Click here for the fifth review in this series, Life After.